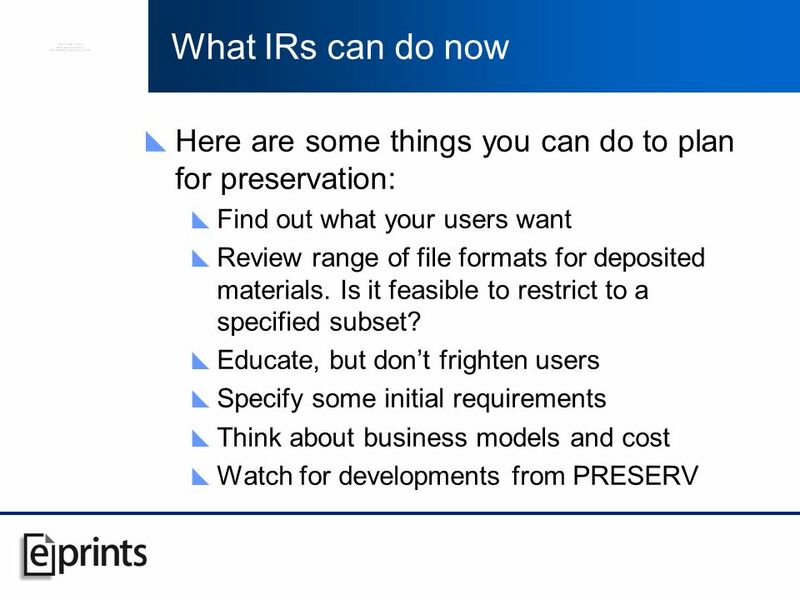 Preservation for IRs. 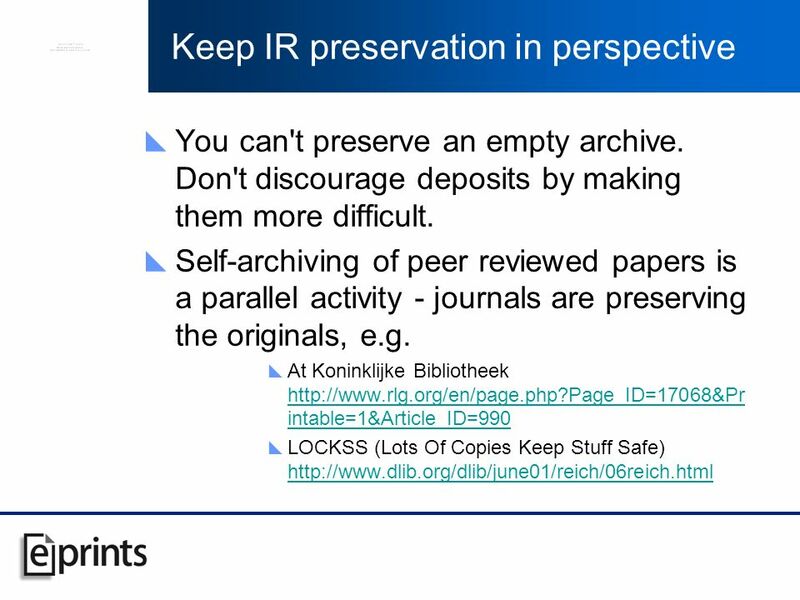 Keep IR preservation in perspective You can't preserve an empty archive. Don't discourage deposits by making them more difficult. 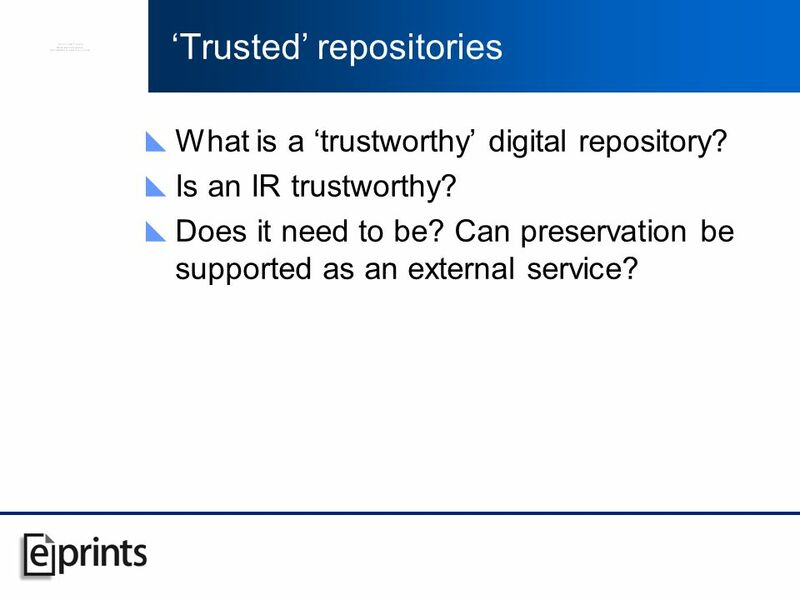 5 Trusted repositories What is a trustworthy digital repository? Is an IR trustworthy? Does it need to be? 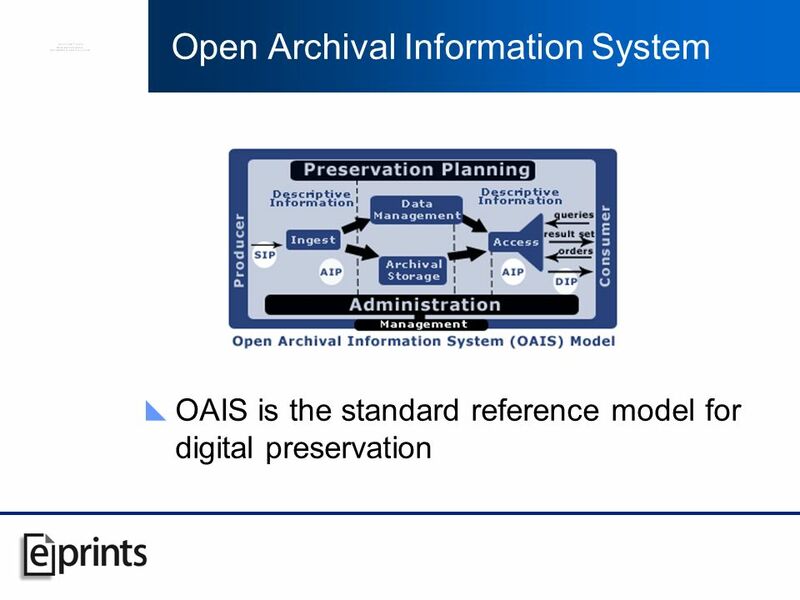 Can preservation be supported as an external service? 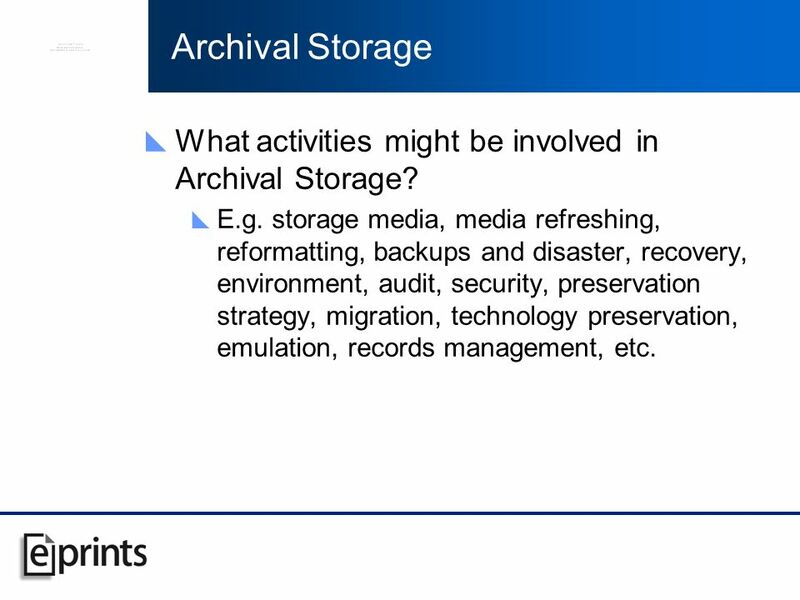 8 Archival Storage What activities might be involved in Archival Storage? E.g. storage media, media refreshing, reformatting, backups and disaster, recovery, environment, audit, security, preservation strategy, migration, technology preservation, emulation, records management, etc. 12 What do researchers want? 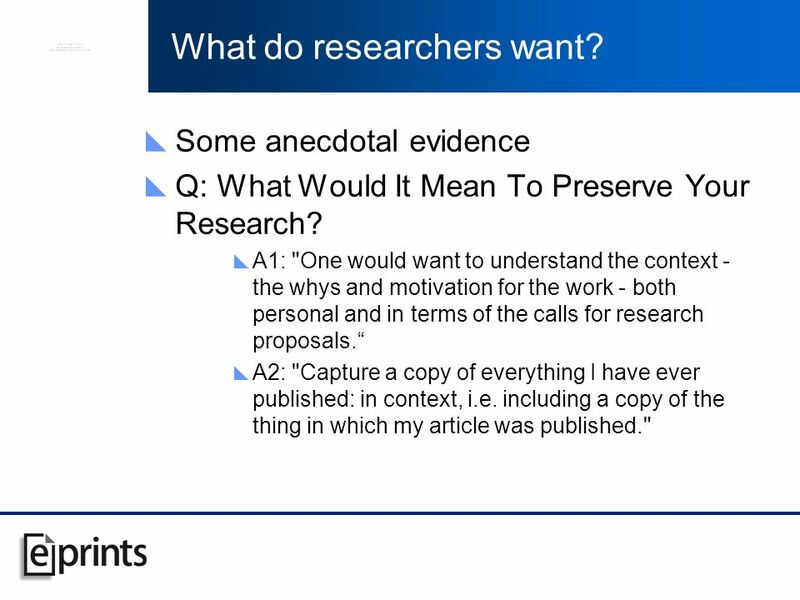 Some anecdotal evidence Q: What Would It Mean To Preserve Your Research? A1: "One would want to understand the context - the whys and motivation for the work - both personal and in terms of the calls for research proposals. A2: "Capture a copy of everything I have ever published: in context, i.e. including a copy of the thing in which my article was published." 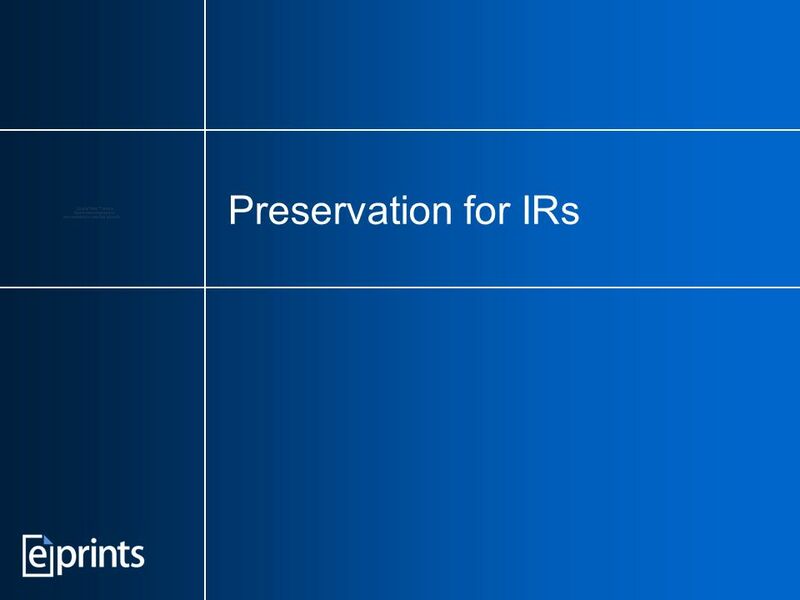 Download ppt "Preservation for IRs. 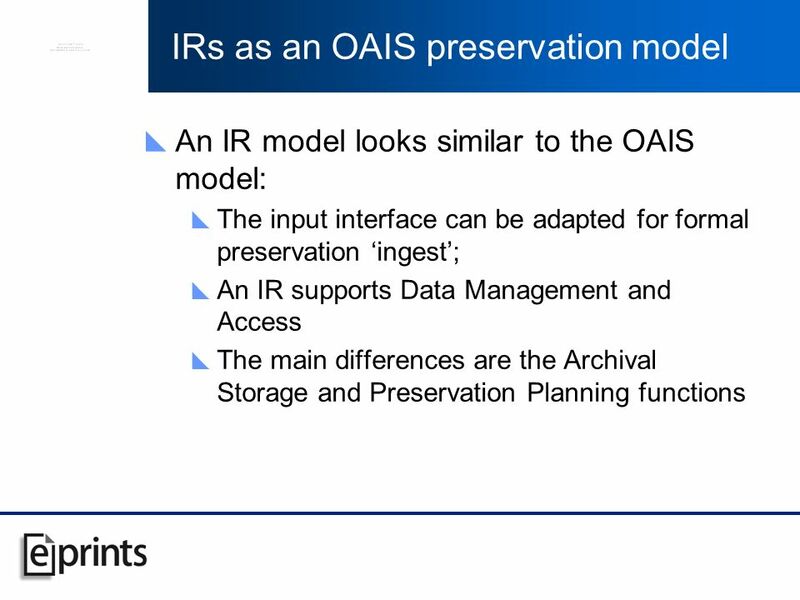 Keep IR preservation in perspective You can't preserve an empty archive. Don't discourage deposits by making them more difficult." 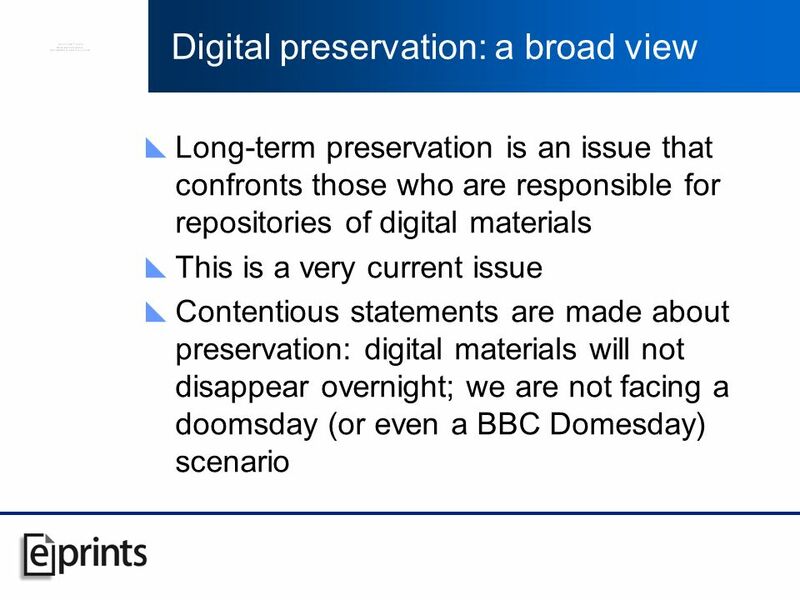 Current State of Play in Digital Preservation Peter B. Hirtle Cornell University Library Society of American Archivists. Capturing preservation metadata from institutional repositories Preserv Project Presented by Steve Hitchcock Intelligence Agents Multimedia Group, School. 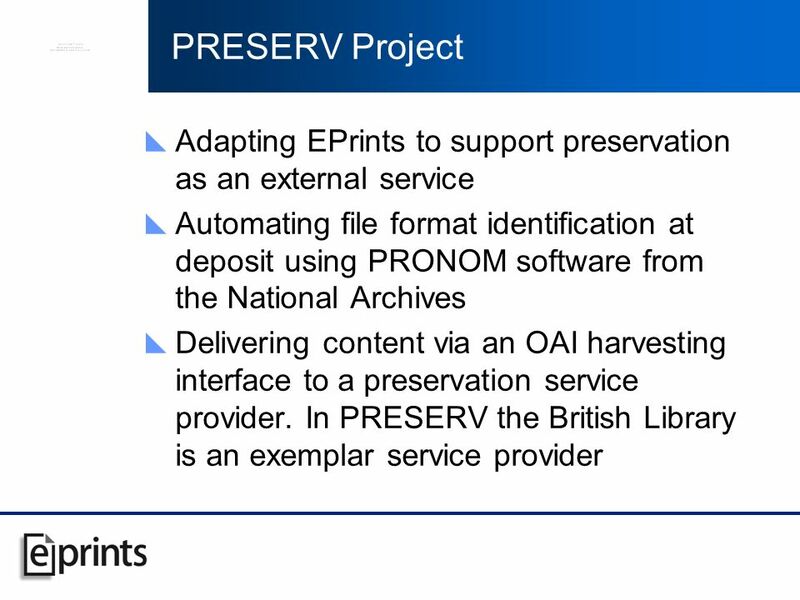 PRESERV PReservation Eprint SERVices A two-year JISC 4/04 project: iii Institutional repository infrastructure development Steve Hitchcock and Jessie Hey. 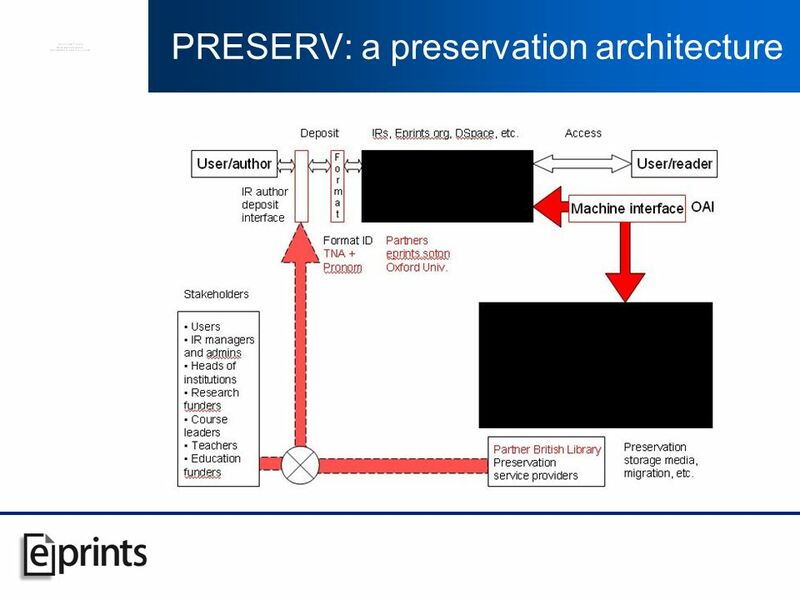 Preserv: Preservation architecture and interface A brief overview of ideas wrt to the project plan For Preserv partners meeting, BL, London, 18th November. Benchmarking the Preservation Process for Electronic Scholarly Journals Brian Lavoie Office of Research OCLC Online Computer Library Center, Inc. DLF Fall. 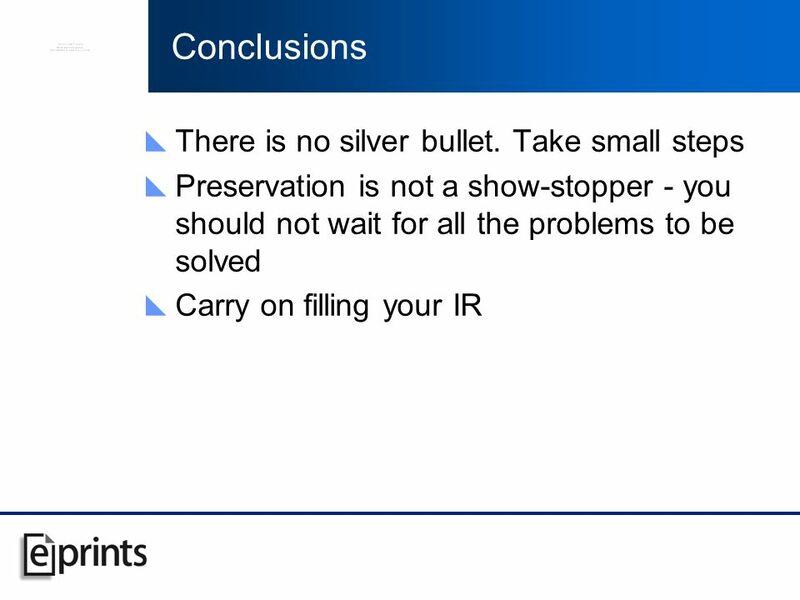 Preservation Rumination Priscilla Caplan, FCLA OCLC DSS February 16, 2005. Theme 3: Architecture. 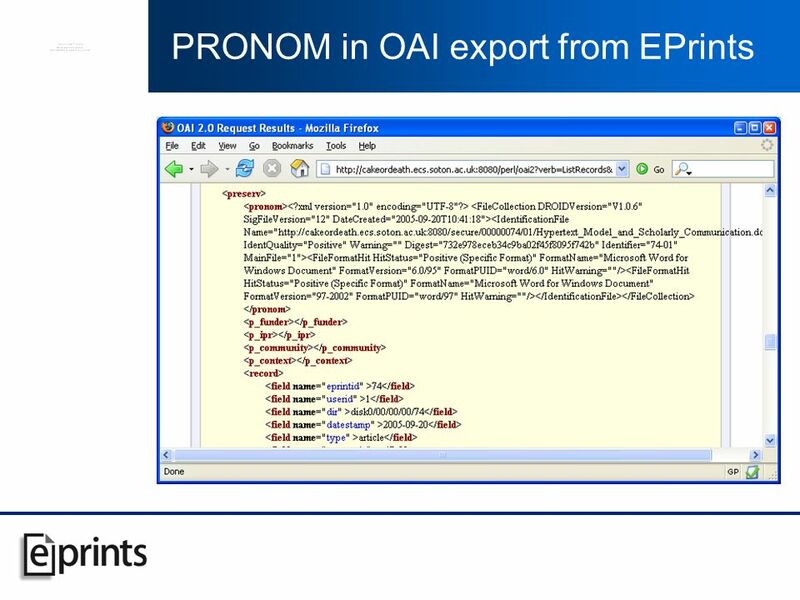 Q1: Who houses stuff, both records and identifiers All useful services and repositories are centralized (latency, etc.) … but centralizing. Introduction to Planets Hans Hofman Nationaal Archief Netherlands Prague, 17 October 2008. 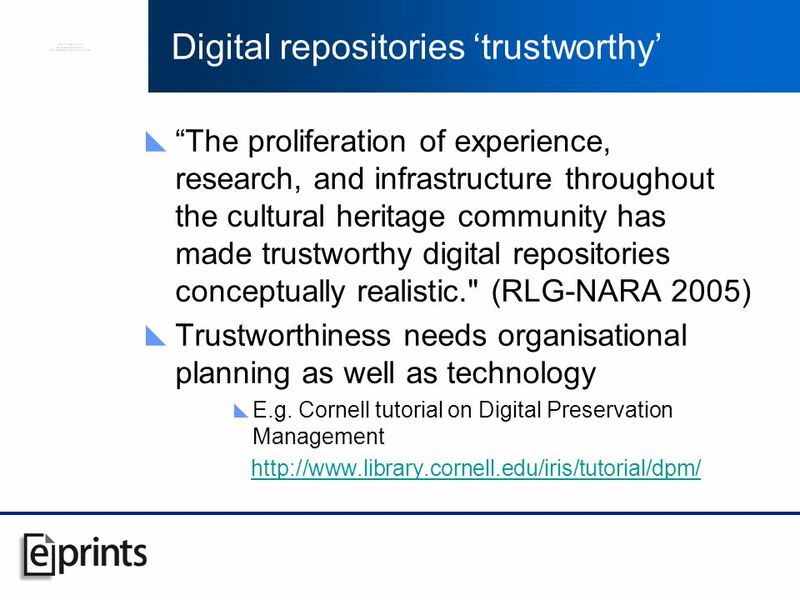 Practical Issues for Institutional Repositories Bill Hubbard SHERPA Project Manager University of Nottingham. UCL LIBRARY SERVICES Enhance the impact of your research with UCL Eprints Suzanne Tonkin Bartlett Library – Site Librarian UCL Eprints Project Officer. Ensuring Enduring Access: A Forum on Digital Preservation, July 21, 2009.